Vintage, 1910 map of Arizona. At that time, Arizona was still a territory. It would not become a state until 1912. Europeans first came to the area in 1694; though it had been settled by native peoples long before that. It was purchased, along with New Mexico, from Mexico with the “Gadsden Purchase” in 1854. The original capital city was Prescott. The capital would be moved to Tucson and back to Prescott before being moved to Phoenix in 1889. Citizens of the territory were able to vote for a single state combined state of Arizona and New Mexico or two separate states. Arizona, with a larger population, out-voted New Mexico and it was decided to split the territory into two states in 1906. 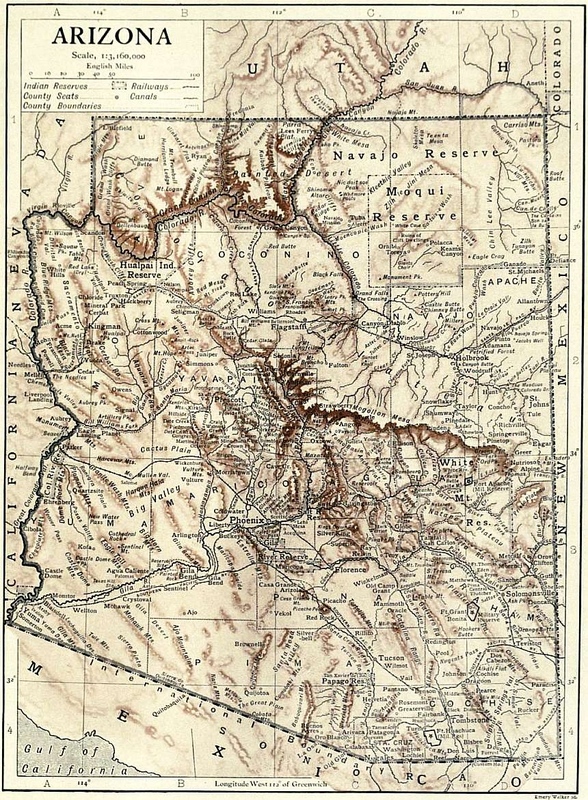 This vintage map of Arizona shows the resultant boundary lines of that vote; even though it was not yet a state at the time of publication. I’ve shared with you a smaller version of the Arizona map here. To see a larger version, simply click anywhere on the map of Arizona to be taken to it.